Meet a couple of the many great companions available at our local animal rescue groups: Larry and Bear. 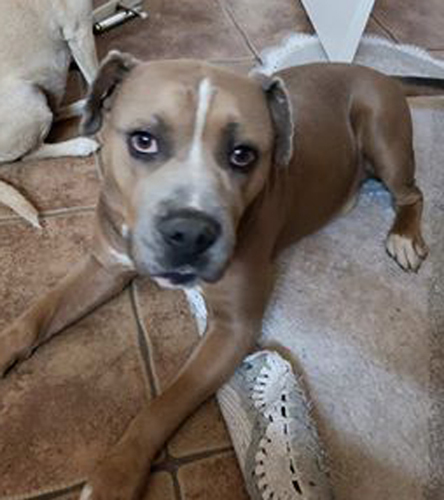 Larry is an adorable four-year-old male "pocket pittie" who ended up at risk for euthanasia at the Pinal County shelter because of bad nose bleeds (The shelter does not have a vet on staff). Larry was diagnosed with tick fever and after treatment is now a very healthy boy. Larry would like you to know that he is kennel-trained and sleeps there at night, but during the day he likes to lie outside in the sun. He also likes a good nap inside on his dog bed. Larry would also tell you he enjoys walks... as long as they aren't too long. He knows the commands "sit" and "stay" and is learning "down." Larry is a very laid-back guy who loves everyone he meets. He is living successfully with cats and several small dogs. In fact, he loves to play with them and with his humans. We are confident that this boy will make a wonderful addition to someone's family. He is neutered, microchipped and up-to-date on his shots. Interested in meeting Larry? Please contact Hard Luck Hounds Az at info@hardluckhoundsaz.org or call 520-261-7677. If you looked up "sweet and gentle" in the dictionary, this senior gal's picture would be right next to it. At almost nine years old, Bear definitely knows her manners and is way past the puppy stage, even though she has puppy cuteness. And she still has pep in her step! She willingly hops into the car and settles into the passenger seat. She knows how to use a dog door, which is fortunate because she is on a very inexpensive medication for bladder incontinence and, if left too long without outside access, she may have an accident inside. She likes leisurely walks, sniffing along the way, and short games of fetch. She is also very gentle when taking treats. But I think her favorite activities are lying or sitting by her human and being pet. She is definitely social with people, and her foster family says she is very attentive and won't leave your side if you're not feeling well. How sweet is that? 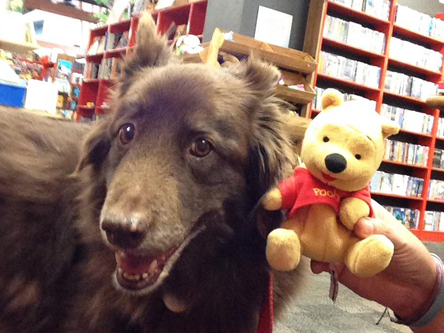 Bear has successfully lived with polite dogs of all sizes as well as with kids aged nine and 12. We thinks she would get along with almost any age group. Bear has been in foster for over seven months! She is ready to spend her golden years with that special someone. She is as sweet as pie and we can't imagine a better dog for a slower-paced lifestyle. She will fit right in and quickly become part of the family. What more could you ask for? Bear is spayed, microchipped and up-to-date on shots. She is looking for a home where she will live inside as part of the family. Interested in meeting Bear? Please contact Hard Luck Hounds Az at info@hardluckhoundsaz.org or call 520-261-7677.